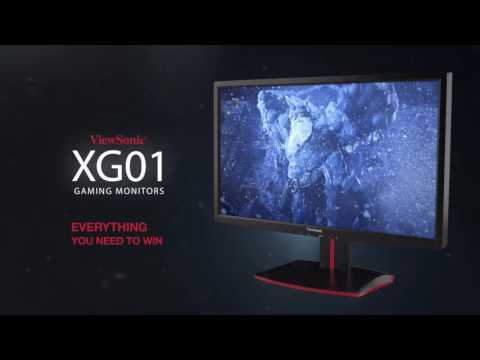 The ViewSonic® XG2401 is a 24" (23.6" viewable) Full HD monitor packed with all the speed and features that diehard gaming enthusiasts need. Featuring an incredible 144Hz refresh rate, as well as VESA Adaptive-Sync Technology, this monitor’s variable refresh rate capabilities virtually eliminate screen tearing and stuttering for fluid gameplay during fast-paced action scenes. A blazing-fast 1ms response time and low input lag provides smooth screen performance even in the most graphic-intense sequences. For optimum speed and performance, SmartSync technology automatically selects the best refresh rate and response time, and lowest input lag needed in FPS games. For a game-winning competitive edge, a Game Mode feature optimizes visuals for FPS, RTS and MOBA. On top of that, a black stabilization function helps you target enemies lurking in the dark, while the monitor maintains brilliantly rich colors and contrast. With a gamer-inspired ergonomic stand that features an integrated headphone hook and cable management functionality, the XG2401 has all you need to conquer your gaming and entertainment quests. Perfect for fast-paced racing and FPS gaming, the XG2401 gaming monitor blazes past competitors at 144 Hz per second – 2.4x faster than a conventional 60Hz display. This produces natural-looking, ultra smooth video with no motion blur. See through your opponent’s strategy with smooth movement, crisp edges and a clear picture at 144Hz. ViewSonic’s exclusive ClearMotiv™II imaging technology delivers an ultra-fast 1 millisecond liquid crystal response time, creating smooth images without streaking, blurring or ghosting. This blazing-fast response time is perfect for the most graphic-intense gaming, and provides amazing visual quality while watching sports or action movies. Experience digital broadcast-quality, full-motion video with razor-sharp images that never blur. Integrating a gaming-oriented OSD design including pre-calibrated FPS, RTS and MOBA gaming settings, each mode is functionally customized with in-game testing and adjustments made for the best blend of color and technology. Providing even more support, three customizable ‘GAMER’ settings are available to help match individual preferences and adapt to every type of game on the market. SmartSync is an advanced OSD menu setting that activates 144Hz, 1ms response time and low input lag simultaneously, so gamers can get straight into the action. Additionally, the setting can be activated at 85Hz, 100Hz, 120Hz, to adjust to each individual’s preference and PC capability. With DisplayPort™ Adaptive-Sync embedded into the monitor, this technology allows for communication between the GPU and monitor, synchronizing frame rate output. Utilizing a dynamic refresh rate, AMD FreeSync™ effectively eliminates tearing, stuttering and jerkiness for smooth gameplay. ViewSonic’s Black stabilization provides heightened visibility and detail by brightening dark scenes. Dominate the competition with enhanced visibility, delivering superior color performance for the ultimate gaming experience. ViewSonic’s Advanced DCR technology automatically detects the image signal and intelligently controls the backlight brightness to improve on the ability to make the black blacker in a dark scene, and make the white whiter in a bright environment. In addition, this technology is able to sharpen the edge of images, making objects and characters in games extremely dynamic and standout clearly, providing better front of screen performance. Flicker-Free technology and a Blue Light Filter help to eliminate eye strain from extended use. DisplayPort, HDMI, and integrated USB inputs enable users to connect to game consoles, Blu-ray players, digital cameras, laptops, satellite boxes, and other high-definition devices. It features a 100 x 100mm VESA-mountable design that allows you to mount the display on a monitor stand or on a wall, depending on your specific needs. With an easily detachable base, it’s easy to mount the display on its new stand or attach it to a wall mount.